Diarrhoea can affect a traveller in any country in the world. It may be a simple self-limiting virus acquired on a cruise ship or even in a good restaurant, but in some circumstances the diarrhoea may be severe, prolonged or even life-threatening. All travellers are encouraged to consider their destination, their accommodation, their own knowledge and experience and their ability to manage diarrhoea should it occur. Depending on your destination, between 20 and 90% of travellers will get diarrhoea. Up to 14% of travellers with traveller’s diarrhoea develop post-infectious irritable bowel syndrome (IBS). Young children are at greatest risk. All sickness acquired abroad, especially diarrhoea, constitutes a greater threat to the traveller, than the same disease at home. Those with intellectual impairment or cognitive difficulties, may need assistance with their care. There is concern that travellers may be vectors for the rapid spread of bacterial infection around the globe. To avoid dehydration, reduce the symptoms and duration of illness and prevent disruption to planned activities. When standard measures fail or symptoms continue on return, a medical consultation, examination of stools and more specific measures are needed. 1. Diarrhoea is defined as three watery motions in a 24-hr period or an explosive motion. Usually self-limiting, diarrhoea may persist for 3-4 days; 10% last longer than a week and 2% last more than a month. Bacteria cause most cases. (Mild looseness of motions is not diarrhoea and, usually, requires no treatment.) Diarrhoea is often defined by new and better experts, but our definition remains. 2. Commonly, poor sanitation causes traveller’s diarrhoea (TD) and the responsible pathogens circulate in the environment, especially in the food or water consumed. Diarrhoea-causing germs may also enter the body of the traveller after handling money, telephones, shaking hands, etc. 3. Prevention of diarrhoea is always preferable to treatment. 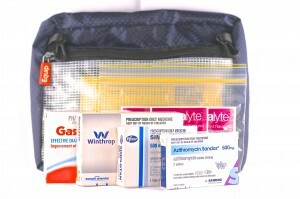 Discuss with your GoodTrips travel doctor how best to avoid diarrhoea when travelling. Learn about hand hygiene, clean water, food precautions, etc. 4. How to maintain hydration in an affected traveller. Despite our best endeavours, infection is sometimes unavoidable and self-management may become a necessity. Young adults are prone to greater risk-taking when eating. Travellers with immune disorders, diabetes or those taking acid-suppressing drugs (omeprazole, esomeprazole, ranitidine, famotidine, cimetidine, etc) are at increased risk of acquiring diarrhoea-causing micro-organisms. The risk of acquiring diarrhoea may, in some countries, be complicated by language differences, availability of medical care and the quality of medications provided. The world may generally divided into 3 grades of risk: – low, intermediate, and high. 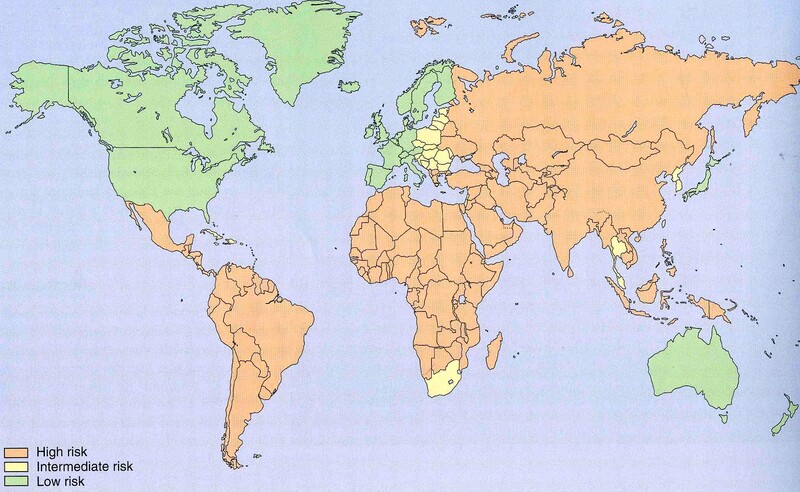 Area A Low-risk countries (green) include the United States, Canada, Australia, New Zealand, Japan, and countries in Northern and Western Europe. Area B Intermediate-risk countries (yellow) include those in Eastern Europe, South Africa, North and South Korea, Thailand and some of the Caribbean islands. Area C High-risk areas (orange) include most of Asia, the Middle East, Africa, Mexico, and Central and South America. There is considerable overlap between these areas and much will depend on the local accommodation, quality of food handling and knowledge of the traveller. If you wish to manage your own diarrhoea, your destination becomes the major factor when selecting medications. Area C Symptomatic relievers, an antibiotic effective in the area travelled, an antiprotozoal agent, electrolyte replacement, written advice sheet. Kits to suit your destination are available from GoodTrips Travel. Please discuss the content of these kits with your travel doctor. Some antibiotics are inappropriate at certain destinations; others may cause problems in some travellers. Evidence emerging of multidrug-resistant (MDR) bacteria colonising travellers has encouraged the need to rethink the management of traveller’s diarrhoea. Aeroplanes have been described as “steel containers for the distribution of MDR bacteria around the world”. We encourage travellers to restrict the use of antibiotics to the self-treatment of severe diarrhoea, as described above. Antibiotics must only be taken according to the dispensing label and any possible side-effects discussed beforehand with your doctor. Inappropriate use of antibiotics may result in inadequate treatment and the importation to Australia of resistant organisms. For children with acute uncomplicated diarrhoea, oral rehydration and early feeding should remain the focus of management. In children who are, malnourished, moderately or severely dehydrated or systemically ill, or who have bloody diarrhoea, the risk of a serious adverse event outweighs any possible benefit from the use of loperamide. Always treat diarrhoea according to the instructions provided with your diarrhoea kit. Your travel doctor will advise on the correct order and frequency of medication use. If you are unable to manage these instructions, always seek help from someone else. You are always advised to never provide your medications to a fellow traveller. You will need them yourself. 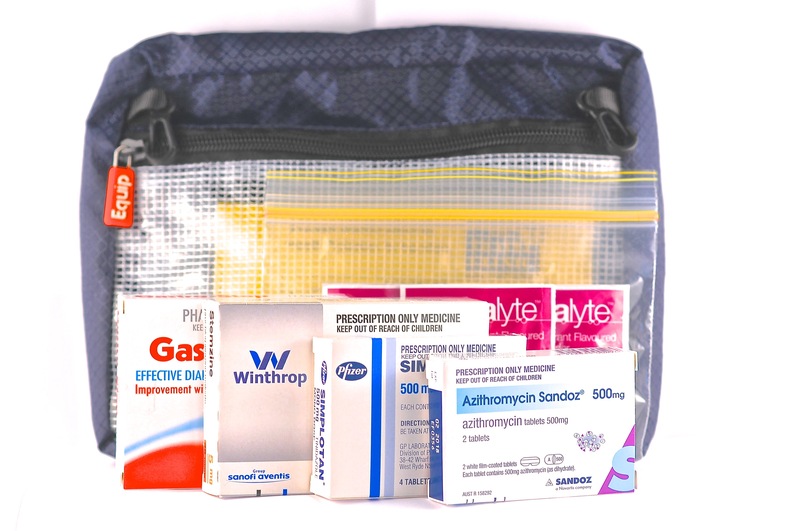 If travelling with a companion, always retain your medication package (especially for antibiotics) after taking the contents. (Alternatively, retain your doctor’s prescription for use in the destination country.) These may assist if further supplies are sought from a local pharmacy. Be aware that, in some countries, generic or fake or ineffective medications may be offered. Insist on replacement of your original medications. If your medications have unfamiliar names or instructions, or are written in a foreign language, please discuss with the dispensing pharmacist. You must be clear on the medications you take.